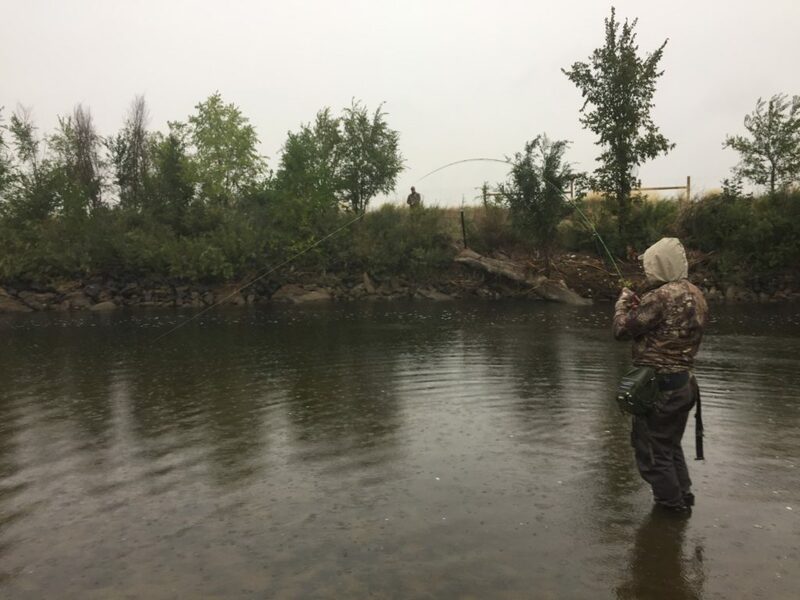 The South Platte Pro-Am Carp Slam occupies a corner of my mind year-round, right next to my carp on the fly obsession. 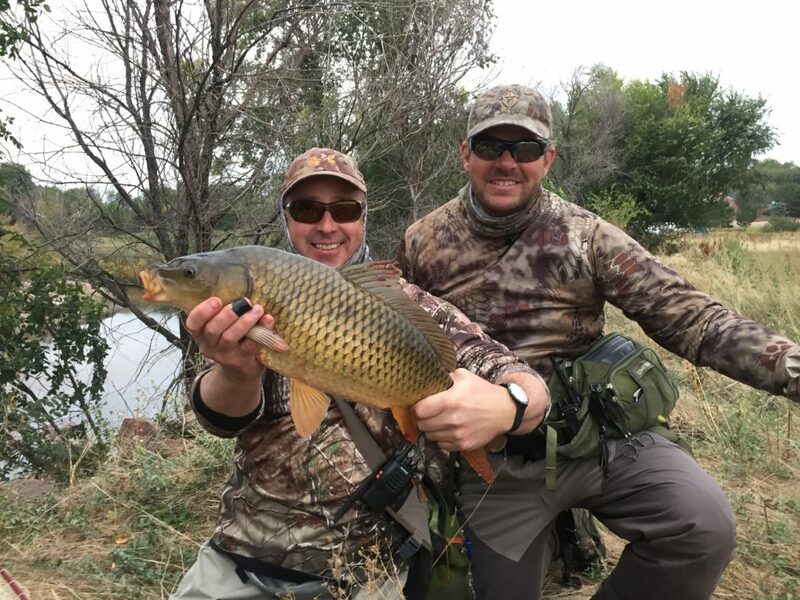 About a month before this year’s tournament, I started scouting the river and fishing to a few resident carp. Unlike previous years, the fish we not very cooperative leaving me a bit concerned. Perhaps they were just in their “dog days” doldrums? The South Platte River was very low and clear, probably the lowest I’ve seen it. This allowed you to see most fish in the river on sunny days. Problem was, they could usually see you too. In one section, fish were happily feeding while I was walking on the river trail. The moment I stopped and looked at them, fish started to disappear into the depths. This was not going to be an easy year. 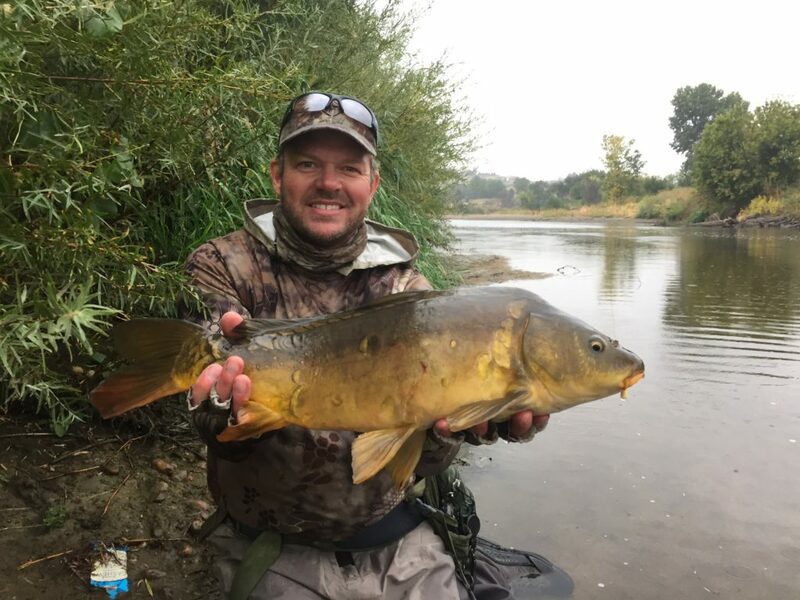 Trevor Tanner, former Carp Slam champ and writer of the Fly Carpin blog, kept careful stats of his monthly catch rates over the years on the DSP – he’s that kind of guy. 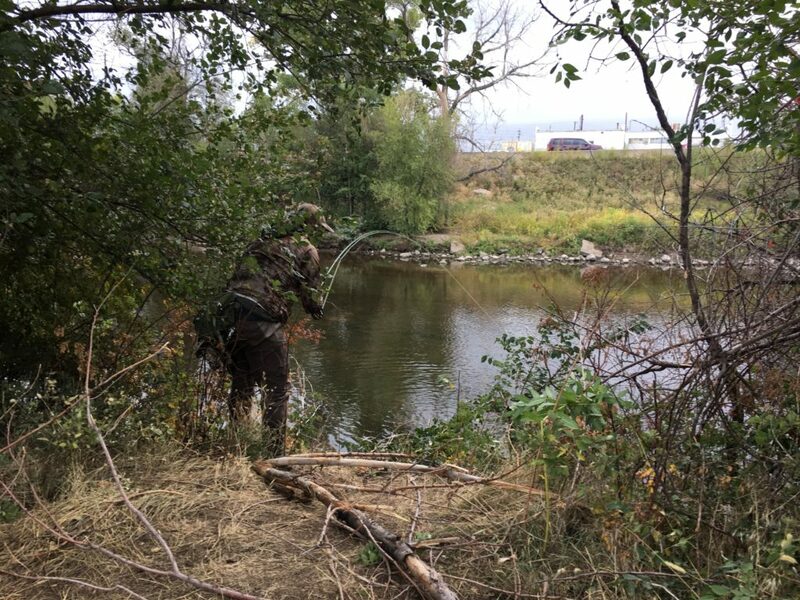 His data showed September to be the most difficult month to catch carp on the fly in river. My anecdotal evidence confirmed his findings. Other than the odd juvenile fish, carp were rejecting almost every fly pattern I tried. Even with good presentations, most fish would approach, sniff, and swim away. As extended weather forecasts began to come into focus, the models were showing a -20 degree temperature drop with clouds and showers in the forecast for the tournament day. Cold fronts are usually no bueno for carp fishing, especially pursuing them with flies. The partner and beat draw event was held in its traditional spot, the Skylark Lounge pool room. 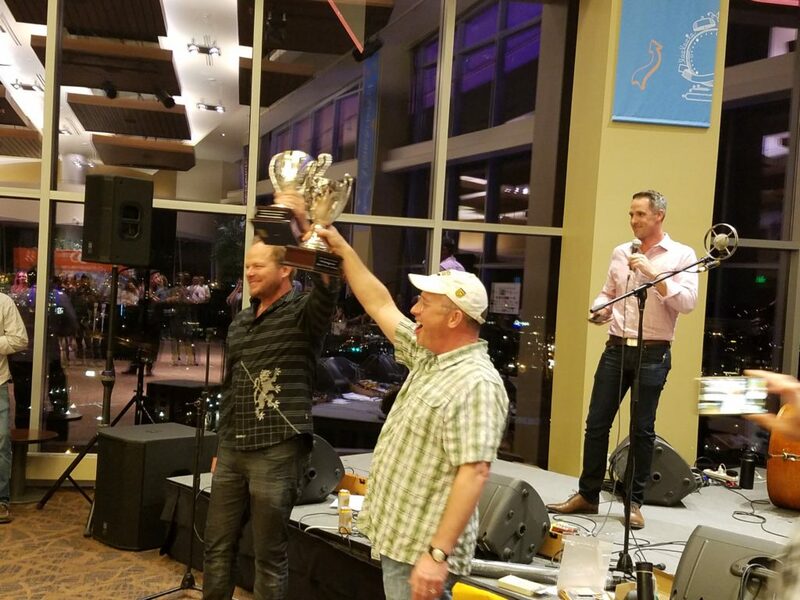 The night was kicked off with a special award to Mike Hobbs for his years of service to Denver Trout Unlimited and the Carp Slam. It was great to see Mike earn a well-deserved award for his sometimes thankless and behind-the-scenes work. Thank you Mike! I ended up paired with amateur Joe Marr, who was returning to his third Slam. Joe later drew beats L and B. L is the Alameda bridge section, while B is upstream of the 120th Parkway bridge. I scouted Alameda in practice, but had only seen the 120th section once. On the social side of things, I caught up with old friends and met some new ones. There’s very little turnover of pros at the event, so I’ve gotten to know most of them over the years. After the draw, my normal evening ritual involves tying last-minute flies and prepping gear, typically with an adult beverage of some sort. As usual, I stayed up way-too-late considering the 5:30 alarm to come, but I couldn’t help it. It’s like Christmas eve for me! The morning of the event, competitors gathered at Black Black Coffee in the Taxi development north of downtown Denver at 7 a.m. to discuss rules and meet their controller for the day. A bit after 8, we’re heading south on I-25 looking for the Alameda exit. Rods are rigged, and packs are donned. 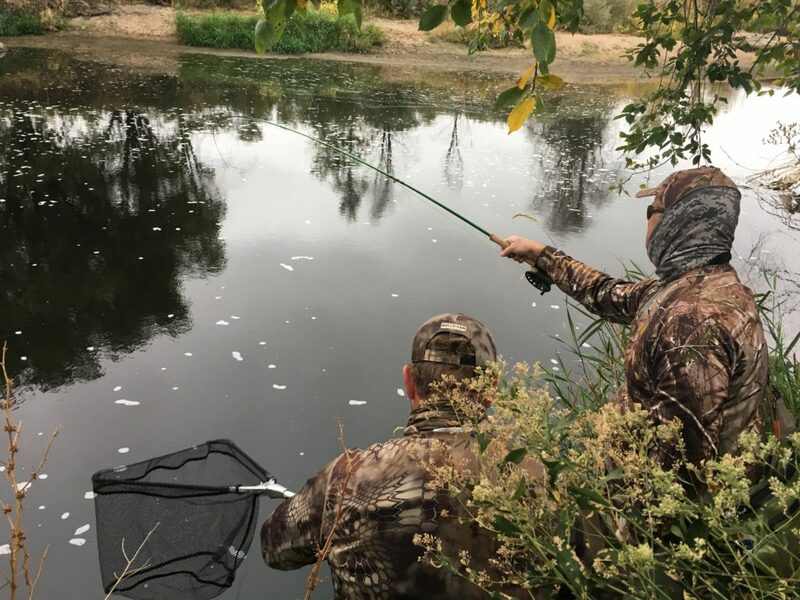 I recommended Joe scout south looking for fish while I headed north to check out a few spots where I’d seen carp during practice. Peering over the edge of a 8′ bluff, I spied a laid-up carp of good size, sitting in some structure. My controller T.K. gave me the nod to start fishing at 9 a.m., and I got my first presentation to the fish. Missed… damn wind. 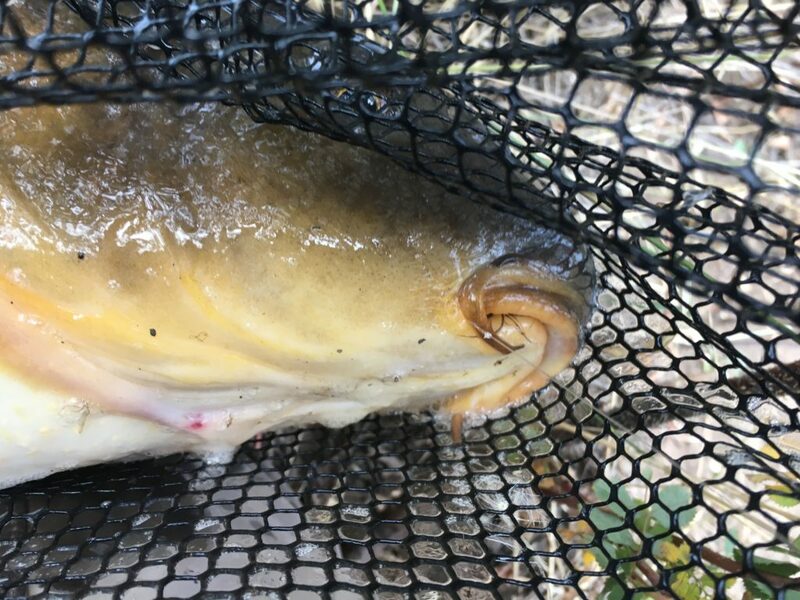 I recasted and manipulated the fly to within about six inches of the carp’s mouth. It slid forward two inches then inhaled the fly. Fish on! 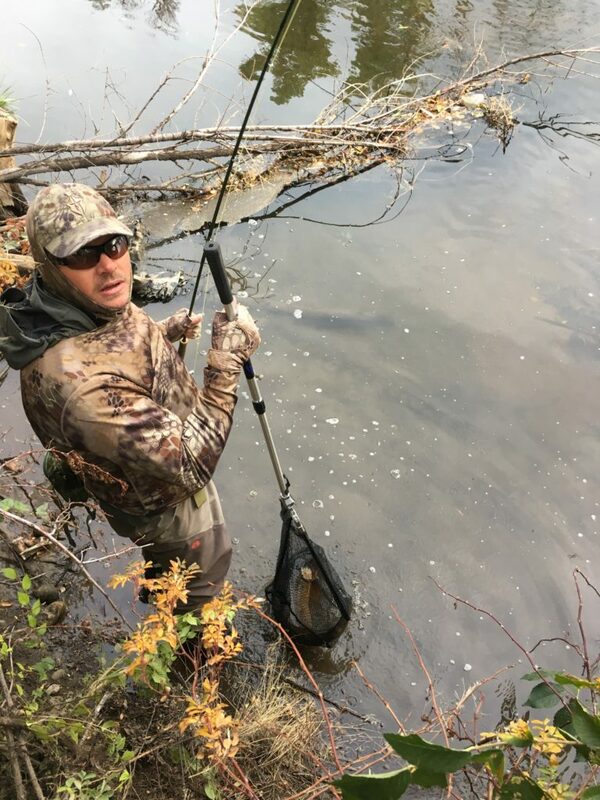 Standing so far above the fish, I could only hope it didn’t decide to run into some brush or other river nasties, as I had limited side leverage. Tightening the drag, I kept the fish in a limited circle until I could slide-drop down into the river. The fish remained friendly and by 9:11 a.m. we were on the scoreboard with a 27-incher! Joe arrived a short time after and dropped down to fish the same structure. Once things settled down, fish began to reappear and Joe took his shots. Although not spooked, the fish didn’t cooperate during his 30-minute session. Next, I started fishing a deep hole where a pipe dumped into the river, seeing four or five carp. Switching flies often, I stayed on them for most of that session, and then finished up underneath the Alameda bridge chasing a tailer that spooked before I could get a cast to it. Joe wanted to keep fishing the structure during his next session, and changed flies to see if he could entice a take. No luck. The last hour of our three-hour session, we are both able to fish. 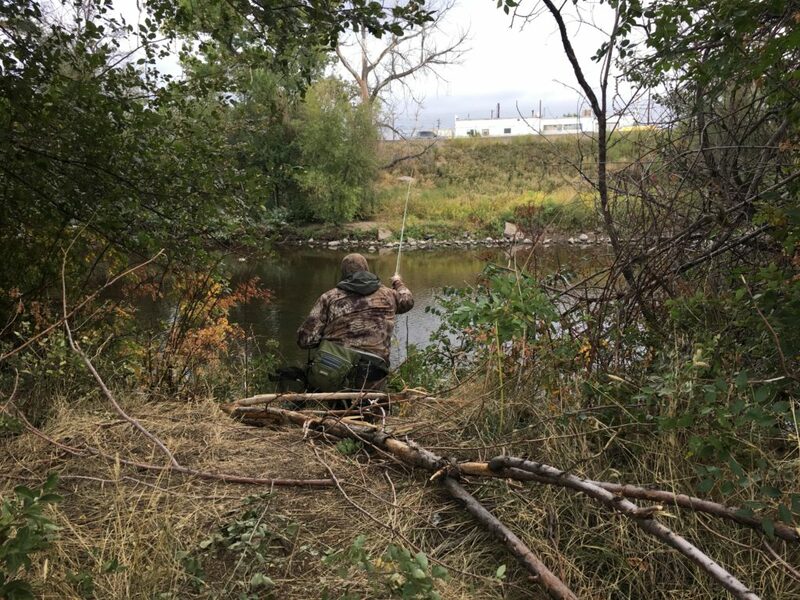 I left Joe to fish the areas he had become comfortable with and went to explore the upper reaches of the beat, eventually crossing the river. I found another piece of structure similar to the one we’d been working and peeked through some trees. 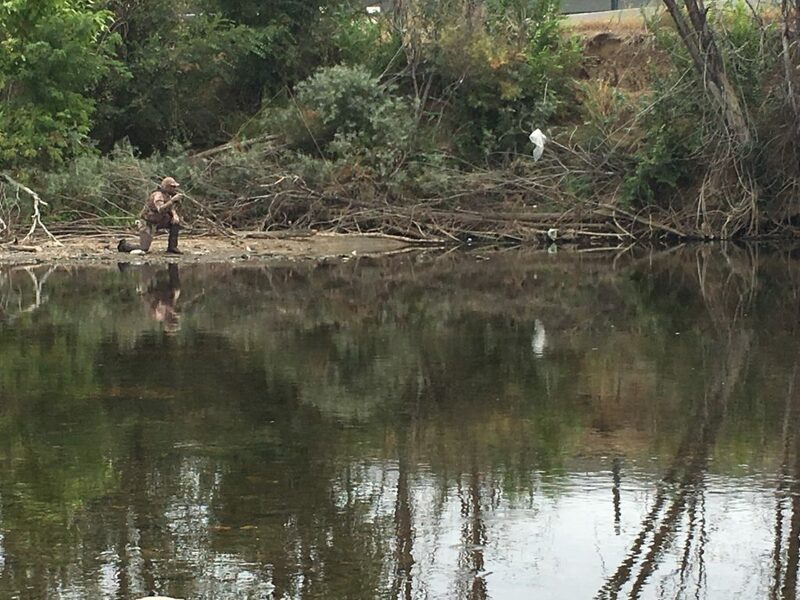 Several juveniles were piled up in the slack water sitting on some leaves. I slid the fly to the middle of them and watched two fish aggressively race to see who could eat it first. It surprised me how fast they got on it and I whiffed the hookset. Up the river a bit, another little guy was working the shallows around a pipe pool. By the time I got into position, the fish was pointing away toward the deeper water. I took the shot, and casted past the fish. The fly settled in position slightly to the left of the fish’s head and he jerked to eat it… whiff #2! I walked back to the structure, where some of the fish had settled down. A lone fish slow cruised up to the leaf pile and I got the fly to it. The fly disappeared into the fish’s mouth and inexplicably I whiffed a third time. The session ended soon after, and Joe hadn’t put one in the net either. 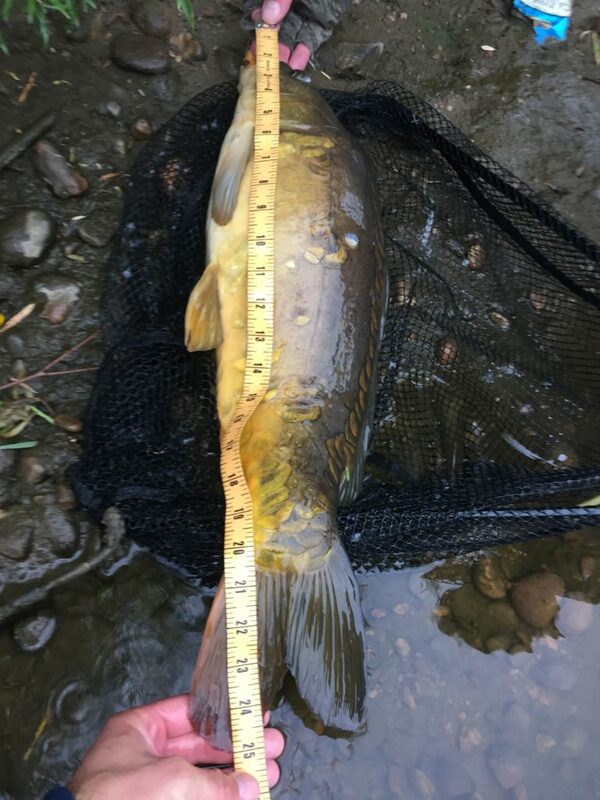 We went to lunch with 27″ of carp. Lunch was back at the coffee shop, where delicious BBQ was brought in. A projector showed a spreadsheet of the scoreboard as teams swapped stories. 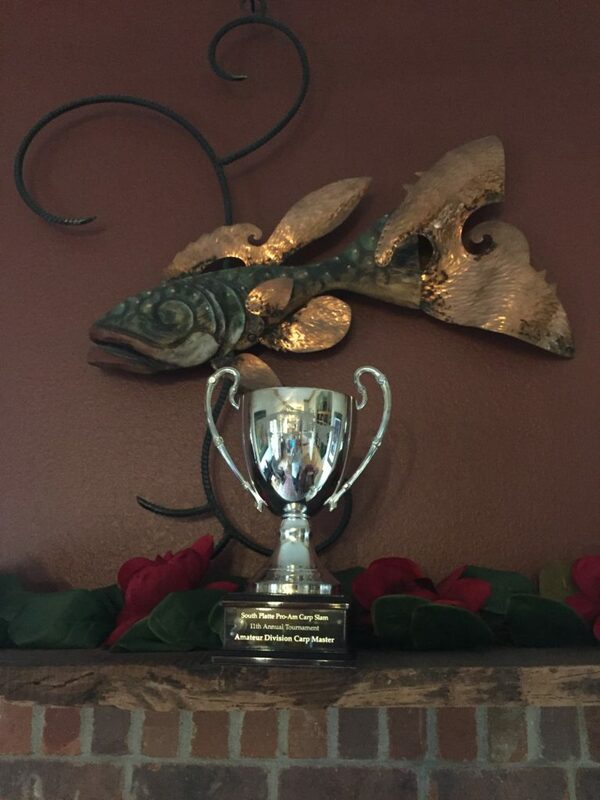 We were tied for fourth with our 27″ and Team Maynard-Stewart had netted two carp for a total of 47″. Following lunch we left for the next beat, upstream of the 120th Parkway bridge. 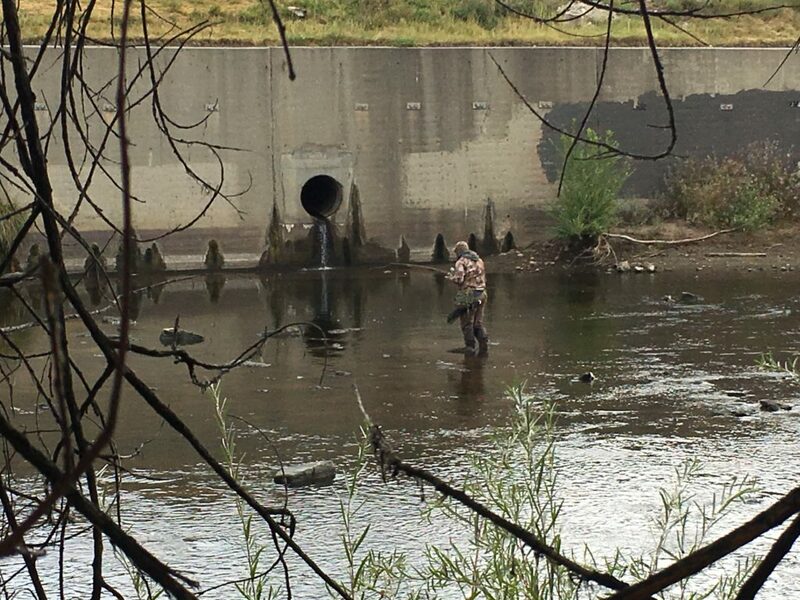 Normally these downstream beats have higher and dirtier water, making sight fishing tough. 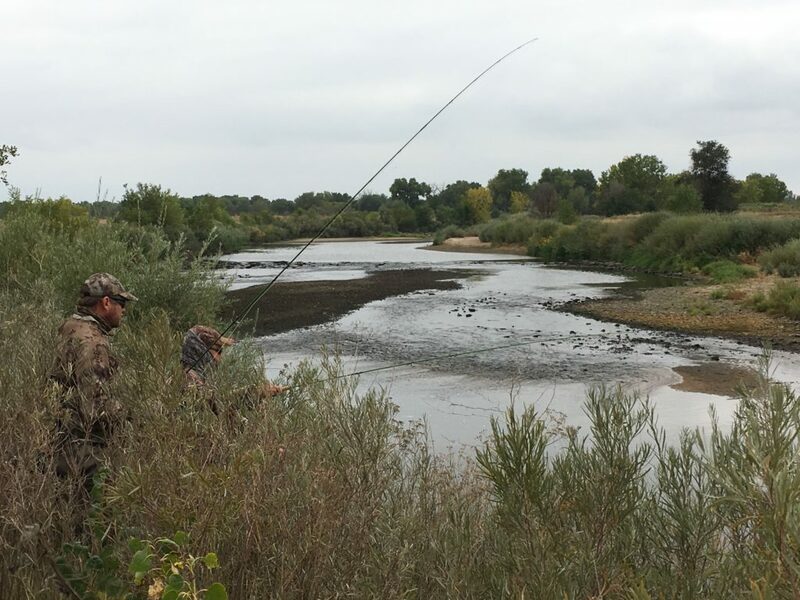 This year’s low flows made the area much more fishable. It wasn’t too long until we began spotting fish. The heaviest concentration of carp were in a bend, but the fish seemed stirred up and were moving quickly through it. We each worked those fish for most of our individual sessions. With one hour to go, the weather turned cooler and some showers fell. The sky was darker and visibility had become difficult. I suggested Joe go check out some slack water below a steep bank, and he left with our controller. I kept looking for shots on my side of the river. Joe was making presentations within shouting distance and I assumed he was seeing fish. A bit later I hear, “Chris!” Joe had hooked up and was going to need help netting the fish from the bank. After the fish finally tired, he carefully maneuvered the fish into my net. It was only after the fish was measured that he told me he was fishing blind! Now things were getting interesting. The rain began to come down harder and I decided to go fish the area we had seen a high concentration of carp. 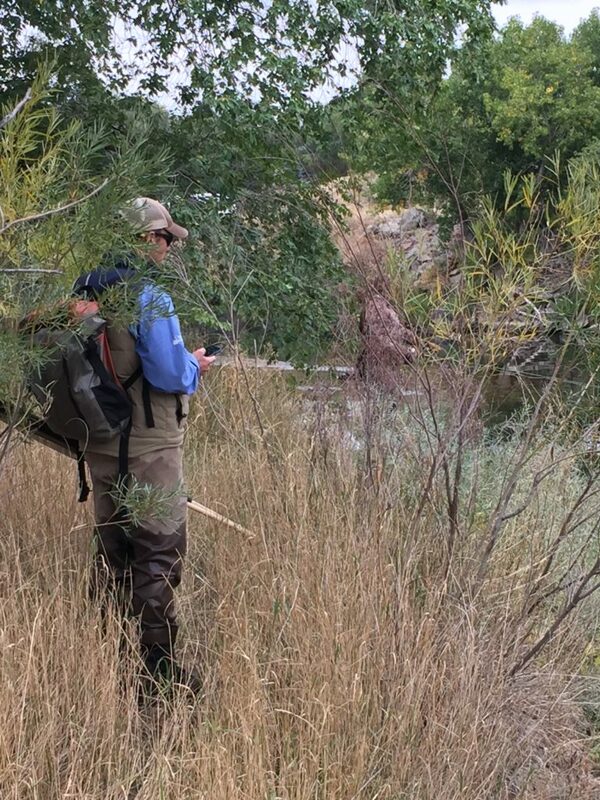 While I hated to do it, I rigged up two flies and an indicator and began running long drifts through the bend. Minutes in I had my first fish on, a 12″ sucker. A few drifts later… a 16″ sucker. Another few drifts… a 7″ smallmouth bass. Time was running low when I hooked a fish that felt much heavier that the previous ones. I took my time and eventually netted what turned out to be a stunning mirror carp. By the time measuring and photos were completed, the session had expired. The third fish was on the board! We walked back to the truck in the cold rain, warmed only by the thoughts of the two carp we plucked in the last hour. 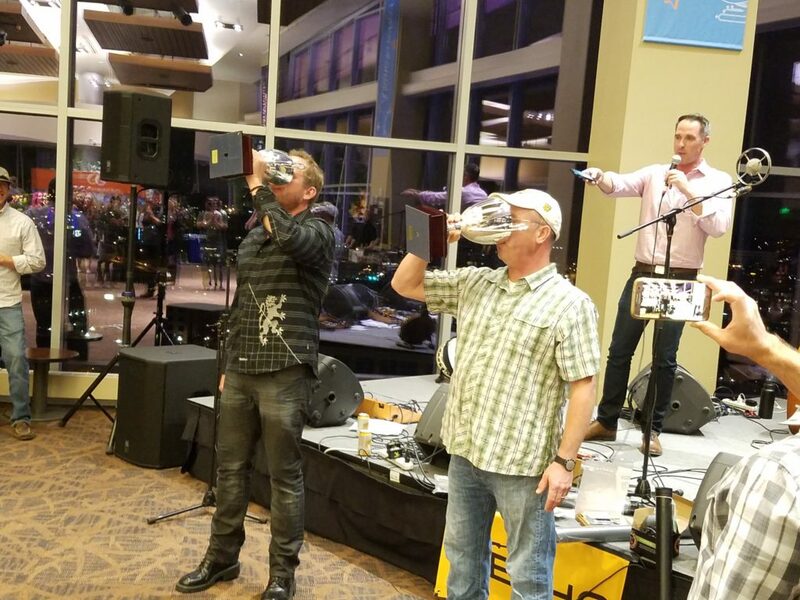 The Carp Slam Afterparty was held in the DaVita building in their event room on the top floor. 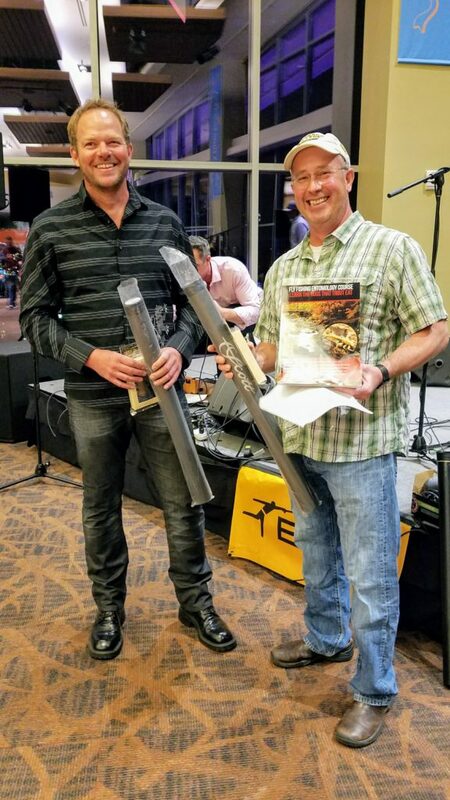 Denver Trout Unlimited held an auction of donated items. Live music was performed by local bluegrass band, Wood Belly. 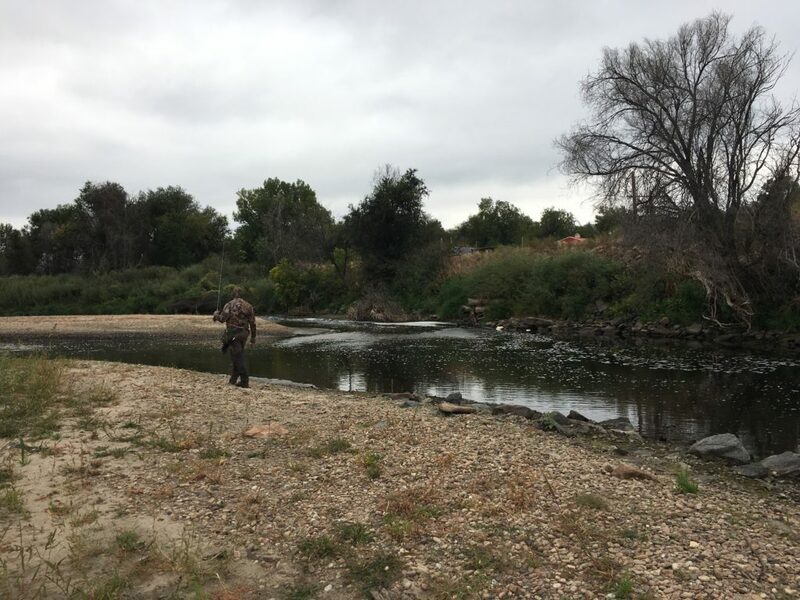 Pros, amateurs, friends, family, and others joined to celebrate and support projects on our local waterway, the Denver South Platte River. Eventually, it was time to announce the results. M.C. Clem Rinehart awarded prizes for most money raised by an amateur to Ronnie Crawford for the second year in a row. Prizes were also awarded for biggest carp and biggest exotic species. Next, the third and second place teams graciously accepted their prizes. 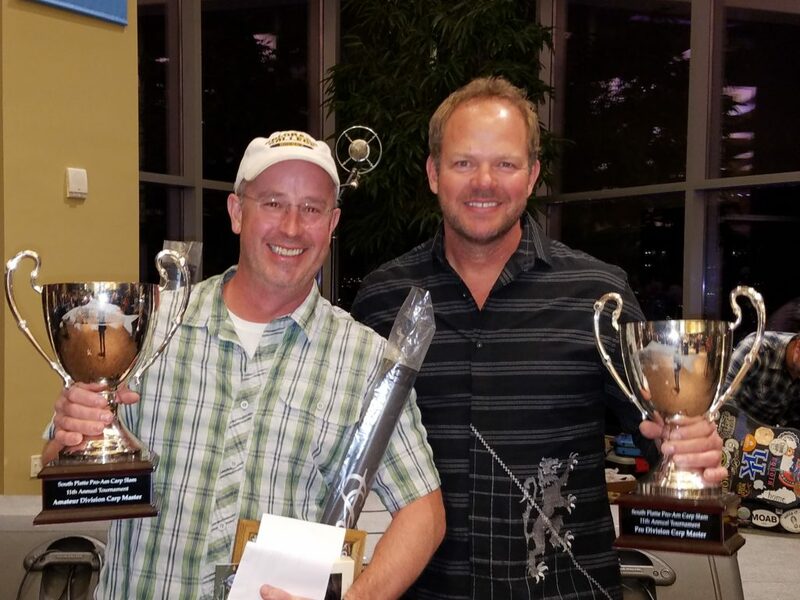 It felt almost surreal when Clem announced first place, “for the THIRD year in a row, Chris Galvin and Joe Marr!” Joe and I slugged beers from the trophies (a Carp Slam tradition) and held them high. I will update this blog as the results become publicly posted. Don’t want to steal any thunder from D.T.U. or the Carp Slam websites. And a special thank you to T.K. Connor for shooting all the photos during the competition!